(NaturalNews) Turmeric has long been one of the most prized spices from the East, but its benefits extend far beyond the wonderful flavor and color it lends to many recipes. The health-promoting properties of turmeric have been known for millennia, but only recently has it been discovered that the bright orange spice is also a powerful ally in preventing and curing cancer. It's been cultivated for more than 5,000 years in the tropics of Asia, where the brown-skinned root with the bright-orange flesh has been valued for the treatment of a number of conditions including "toothache, chest pain, urinary tract infection, flatulence, jaundice, menstrual discomforts, bruises, hemorrhage, and colic." The spice made its way to the West through Arab trade routes during the 13th century and has become popular throughout the world. Turmeric is now grown in tropical regions such as India, the Philippines and the Caribbean, and is probably best known as one of the fundamental ingredients of curry dishes. It has more recently been discovered that turmeric has the potential to replace chemotherapy and radiation in the treatment of certain cancers – and it has been proven to prevent and fight virtually every type of cancer. Turmeric's active ingredient is an extracted compound called curcumin. Studies have shown that curcumin helps prevent several forms of cancer including breast, lung, stomach, liver, and colon because of its anti-inflammatory and antioxidant properties. It stops the development of cancer by interfering with the cellular signaling aspects of the chronic disease. Curcumin's nearly miraculous "smart kill" properties work to inhibit the growth of tumors and the spread of cancer in fundamental ways at the cellular level. It has the laboratory-proven capability to inhibit a particular cancer-promoting enzyme (COX-2), impede blood supply to cancer cells, induce tumor-suppressing genes, stop metastasis (the spread of cancer throughout the body's organs), kill lymphoma cells and prevent the regrowth of cancer stem cells. 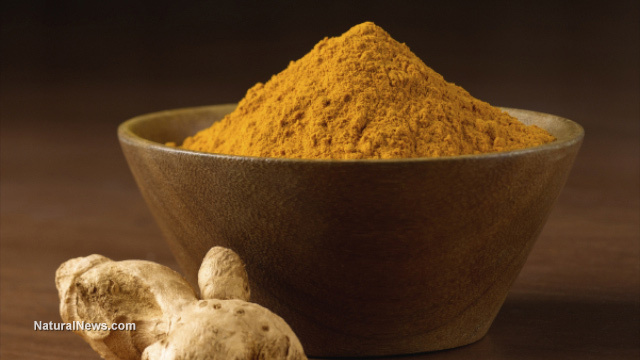 The ability to target cancer stem cells is one of curcumin's most powerful anti-cancer properties, as a recent study revealed. [T]he study describes the wide range of molecular mechanisms presently identified by which curcumin attacks cancer stem cells (CSCs), which are the minority subpopulation of self-renewing cells within a tumor colony, and which alone are capable of producing all the other cells within a tumor, making them the most lethal, tumoriogenic of all cells within most if not all cancers. Because CSCs are resistant to chemotherapy, radiation, and may even be provoked towards increased invasiveness through surgical intervention, they are widely believed to be responsible for tumor recurrence and the failure of conventional treatment. It can only be hoped that the FDA and Big Pharma don't find a way to outlaw curcumin, since it seems to have as much promise as marijuana as a cancer preventative and cure. That statement is made only partly in jest because, as always, if a potential cure for a disease can be found in Nature, the pharmaceutical drug makers have no use for it since it cuts into their profit margins. When natural cures and preventatives are proven to have merit, the drug industry will typically go to great lengths to denounce and prevent their use, or at least find ways to synthesize and patent them so that they can be sold to the public for enormous profits, whether their versions are safe and effective or not – and often the pharmaceutical versions are neither. So it's a good idea to begin introducing turmeric into your diet now (if you haven't already) – and it happens to be a very versatile spice. Curries wouldn't be the same without turmeric – it's one of the main spices found in most variations of the dish and provides its distinctive color and taste – but it's also a fantastic ingredient that can be used in many other recipes, including soups, meats, rice dishes, and stews. It's also great with eggs, potatoes and even smoothies. In addition, you can also pair it with black pepper, which helps make curcumin more effective.